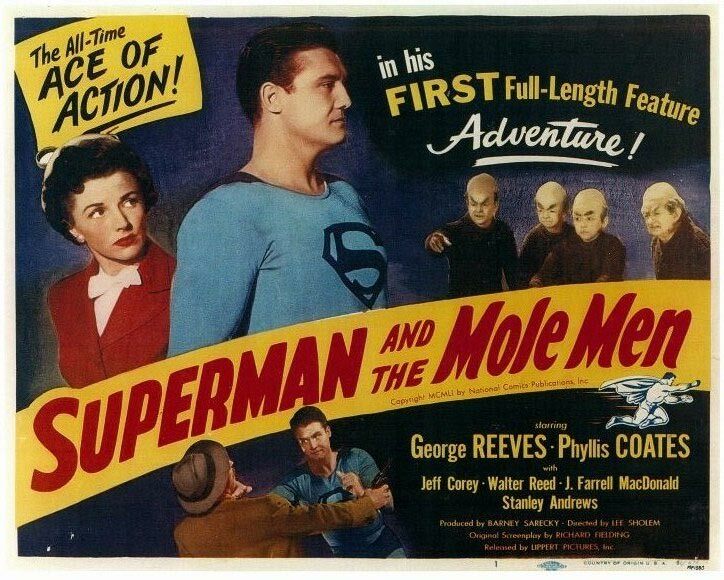 I thought I would start this series of videos about super-hero films by stopping and taking a moment to remember the very first Superman feature-length, big screen adventure that was released a mere thirteen years after the characters creation – Superman and the Mole Men from 1951. Let’s be clear here. There had already been a live-action Superman that fans had seen in movie theaters. Superman in 1948 and its followup Atom Man vs. Superman in 1950 were film serial adventures starring Kirk Alyn as the Man of Steel. Kids would have to come back to the theater the next week to see each chapter to discover how Superman would ultimately triumph in the end. Superman and the Mole Men was the first Superman feature film. That’s pretty much the reason why I choose to start with it when I began my Superhero Film review series. The film stars George Reeves as Clark Kent, Phyllis Coates as Lois Lane and a handful of little people with some creepy-looking makeup. Our two reporters from the Daily Planet find themselves in the small town of Silsby to cover the opening of the world’s deepest oil well. However, all this drilling has disturbed the home of the underground dwelling ‘Mole Men’. These small creatures make their way to the surface and start causing a panic that overruns the town of Silsby. It’s up to Superman to maintain order amongst the frightened citizens and stop the Mole Men. Whenever I watch this movie I always think about how much fun it must of been to be a little kid in 1951, their wonder when this movie unspooled in front of them and their reactions to seeing Reeves for the first time as Superman. Today the film looks very quaint, but back then all of it must of been dazzling for young superhero fans to see. Superman and the Mole Men would be the kick off to the wildly popular Adventures of Superman television show that starred Reeves from 1952 to 1958. The show would leave a lasting impact on young viewers. Kids were tying bedsheets around their necks, pretending to fly and huddling up close to their televisions to watch the latest episode. 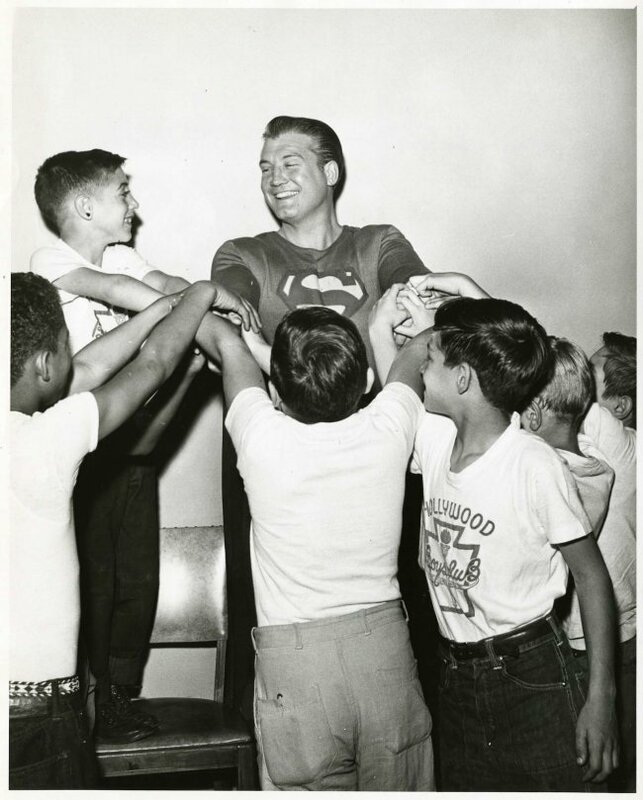 In their eyes George Reeves was Superman. Looking at old photos of Reeves surrounded by young fans and the excitement in their eyes you can see that statement is no exaggeration. So here’s my look at 1951’s Superman and the Mole Men.